There are three main types of algebra average word problems commonly encountered in school or in tests like the SAT: Average (Arithmetic Mean), Weighted Average and Average Speed. 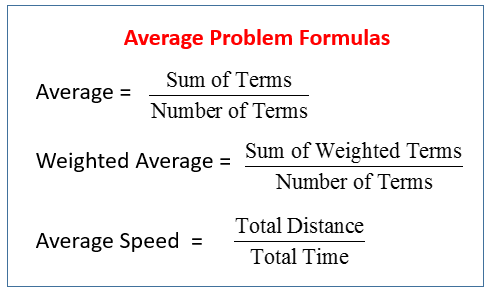 The following table shows three formulas used in average problems: Average (Arithmetic Mean), Weighted Average and Average Speed. Scroll down the page for examples and solutions. The average (arithmetic mean) of a list of 6 numbers is 20. If we remove one of the numbers, the average of the remaining numbers is 15. What is the number that was removed? Step 1: The removed number could be obtained by difference between the sum of original 6 numbers and the sum of remaining 5 numbers i.e. Answer: The number removed is 45. 1. Timothy's average score on the first 4 tests was 76. On the next 5 tests his average score was 85. What was his average score on all 9 tests? 2. Tracy mowed lawns for 2 hours and earned $7.40 per hour. Then she washed windows for 3 hours and earned $6.50 per hour. What were Tracy's average earnings per hour for all 5 hours? 3. After taking 3 quizzes, your average is 72 out of 100. What must your average be on the 5 quizzes to increase your average to 77? How to solve algebra average problem? If the average (arithmetic mean) of 8,11,25,and p is 15, find 8 + 11 + 25 + p and then find p.
If a = 3b = 6c, what is the average (arithmetic mean) of a, b and c in terms of a? Another type of average problem involves the weighted average - which is the average of two or more terms that do not all have the same number of members. To find the weighted term, multiply each term by its weighting factor, which is the number of times each term occurs. A class of 25 students took a science test. 10 students had an average (arithmetic mean) score of 80. The other students had an average score of 60. What is the average score of the whole class? Step 1: To get the sum of weighted terms, multiply each average by the number of students that had that average and then sum them up. Answer: The average score of the whole class is 68. Be careful! You will get the wrong answer if you add the two average scores and divide the answer by two. How to calculate a weighted mean (weighted average)? Fifteen accounting majors have an average grade of 90. Seven marketing majors averaged 85, and ten finance majors averaged 93. What is the weighted mean for the 32 students? How to use weighted average to calculate the average score of a student? John drove for 3 hours at a rate of 50 miles per hour and for 2 hours at 60 miles per hour. What was his average speed for the whole journey? Answer: The average speed is 54 miles per hour. Be careful! You will get the wrong answer if you add the two speeds and divide the answer by two. How to calculate average speed? 1. Mr. Myones drives 3 hours at an average speed of 40 miles per hour. Then he drives 2 hours at a speed of 35 miles per hour. What is his average speed for the whole trip? 2. Miss Holton drives 4 hours at an average speed of 30 miles per hour. Then she drives 2 hours at a speed of 45 miles per hour. What is her average speed for the whole trip? 3. A family took 2 hours to drive from City A to City B at a speed of 55 miles per hour. On the way home they took 3 hours at a speed of 40 miles per hour. What was their average speed for the whole trip? How to find average speed? A rocket traveled at 3000 mph on the way to fix the Hubble Space Telescope. On the way back, it was traveled at 1000 mph. What was the average speed?